Along with one-dimensional array, c programming also allows multidimensional arrays. In this tutorial, you will learn about c programming multidimensional arrays. In one-dimensional arrays, elements are arranged in one direction but in multidimensional array data items are arranged in multiple directions. 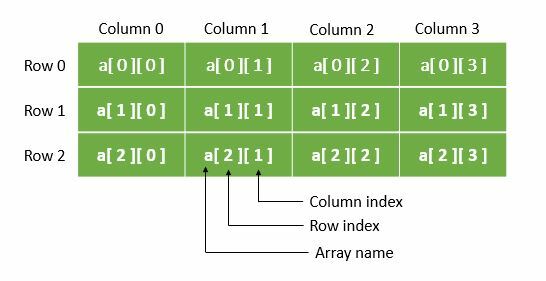 Like in two-dimensional array data items are arranged in two directions i.e rows and columns. Data items arranged in the horizontal direction are called rows and that in vertical directions are referred as columns. Moreover, the following picture explains the concept of a C programming multidimensional array. An array is a sequenced collection of similar kinds of data items that can be represented by single variable name. The individual data item in an array is called element. How do we initialize a two-dimensional array? Defining double array elements as a[x,y] instead of a[x][y] is programmer error rather than syntax error because the comma is treated as an operator. Example: Initializing C programming multidimensional arrays. There are three arrays in this program. The elements of an array that are not initialized explicitly are initialized zero, as in the second and third array of the above program. The subscripts of every array are used by the compiler to determine the location of array elements in the memory.